Splash Mountain Critter Country flume attraction at Disneyland; opened on July 17, 1989. Based on animated sequences and characters from Song of the South. 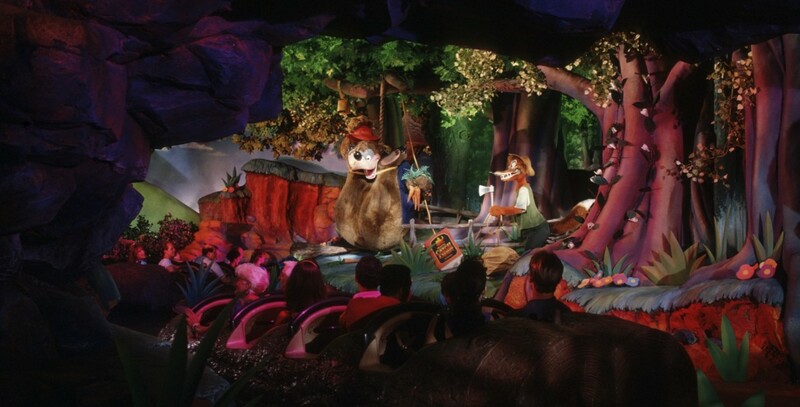 Many of the Audio-Animatronics characters from the closed America Sings attraction were renovated and placed in Splash Mountain. Some new ones were added also, namely Brer Bear, Brer Fox, and Brer Rabbit, making a total of 103. Guests travel through backwoods swamps and bayous in their hollowed-out log. The culmination is a high-speed 52-foot flume drop, at a 45-degree angle, which can almost assure the guests of getting splashed. At opening, it was the longest flume chute in the world. Disney designer Tony Baxter came up with the idea for the attraction while stuck in his car during rush-hour traffic in 1983. Also Frontierland attraction in Magic Kingdom Park at Walt Disney World; opening July 17, 1992, and in Critter Country at Tokyo Disneyland; opening on October 1, 1992.